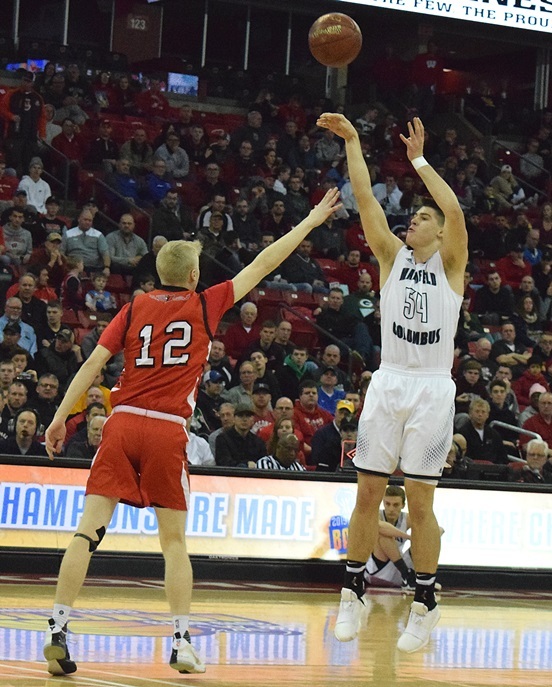 A number of local seniors and coaches will be part of the Wisconsin Basketball Coaches Association All-Star Games this summer in Wisconsin Dells. The Girls All-Star Games will be held Friday, June 14, and the Boys All-Star Games will be Saturday, June 15, at the Just-A-Game Fieldhouse in Wisconsin Dells. Marshfield coach Scott Scheuer will coach the Division 1 White team, with Marshfield assistant Chris Fischer and Columbus Catholic head coach Joe Konieczny serving as his assistants. Columbus Catholic players Bryce Fuerlinger and Jarred Mandel, fresh off an appearance at the WIAA State Tournament and a runner-up finish in Division 5, will be on the Division 5 White team. Scheuer led Marshfield to a share of the Wisconsin Valley Conference championship this season, the Tigers’ first since 1010. Fuerlinger led the Dons in scoring at 16.1 points per game and the conference in rebounding at 13.6 per game. He set new Division 5 state tournament records for most rebounds in a game (25) and in a tournament (34). Mandel averaged 14.8 points, 4.9 rebounds and 5.2 assists per game, while leading the Dons with 63 made 3-pointers. Marathon’s Carter Hanke and Auburndale’s Colton Wright will play for the Division 4 White team. Hanke led the Marawood Conference South Division in scoring at 19.3 points and rebounding at 7.8 per game, shooting 59.1 percent from the field and 75.7 percent at the free throw line, and was named conference Player of the Year. Wright topped the Apaches in scoring at 15.4 points per game and made 50 3-pointers, which was second in the conference. Marshfield’s Jenna Jakobi will be on the Girls Division 1 North Team. Jakobi, a first-team All-Wisconsin Valley Conference selection this past season, led the Tigers in scoring at 16.1 points per game in conference play. She led the Valley in field goal percentage at 58.9 percent (73-for-124), and was fourth in the free throw shooting at 78.3 percet (47-for-60), and assists (4.5 per game). Spencer head coach Lauren Anklam will coach the Division 1 North girls team. Colby’s Ashley Streveler and Vanessa Lopez will play for the Girls Division 4 North team. Streveler and Lopez were instrumental in helping the Hornets to the WIAA State Tournament for the first time. Cloverbelt Conference East Division Player of the Year Jennifer Wendler of Owen-Withee and Athens’ Kenadi Diedrich, the Marawood Conference North Division Player of the Year, were named to the Division 5 North girls squad. Players and coaches are asked to raise money for the MACC Fund (Midwest Athletes Against Childhood Cancer) through individual and business sponsorships. All participants have pages set up at wisbca.org, where people to donate. Click here to find your favorite player or coach to help out. Both Division 1 boys teams and coaches, along with the two Columbus Catholic players, will be going to the Marshfield Children’s Hospital at the Marshfield Medical Center on June 13 to visit with patients and present a donation.